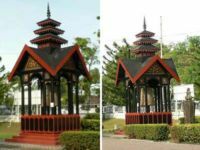 Banda Aceh is the capital of the Indonesian province of Aceh on the island of Sumatra. Around 150,000 people were killed in Banda Aceh in the Tsunami of 26 December 2004. Some parts of the city became permanently submerged. Many aid agencies have been present since then to help rebuild. A view of the city of Banda Aceh from a helicopter, showing the results of the Tsunami and the rebuilding effort. The long conflict between the Acehenese independence movement (GAM) and the Indonesian army (TNI) has been solved for the time being by the peace agreement on 15 August 2005. The peace process has been quite smooth since. On 11 December 2006 the province held its first direct and democratic local elections. On 8 February 2007 the first democratically elected governor, Irwandi Yusuf, was inaugurated. 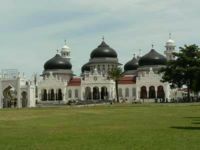 Foreigners no longer require a travel permit (Surat Jalan) to enter Aceh, but an Indonesian visa is required. Since 6 June 2010, it is possible to get a 30 day Visa-on-Arrival at Banda Aceh Airport. The Embassy in KL can sometimes process the visa in the same day if you complete all the paperwork before noon, though officially this only applies to Malaysian residents( 60 day visa is no longer available at KL, so visa on arrival is the best bet, although you can still get a 60 day visa in 2 days in Penang(Jul '15)). There are non-stop night buses, with travel times ranging from 9-13 hours - from Medan to Banda Aceh. Major bus companies such as PMTOH, Pelangi, Kurnia and Pusaka have offices on Jl. Gajah Mada, Medan. As of June 2017, a regular seat in a bus or mini van costs about 240,000, and Pelangi Mercedes Benz buses cost 340,000. 2019 update: 200.000 Rp for a seat in a big a/c touringcar with Putra Pelangi from the tugu (monument) in Binjai. Mini-buses can also take you to Banda Aceh from the Medan area, but journeys are generally longer. Prices are a bit cheaper than the coaches. It is also possible to travel over from Medan to Banda Aceh via Kutacane and Takengon. This will be 20 hr in total. Sultan Iskandar Muda Airport, (IATA: BTJ, ICAO: WITT) is named after the twelfth sultan of Aceh, Iskandar Muda. Airlines fly daily between Banda Aceh and either Medan, a 1 hr trip, or Jakarta, a 2 hr 40 minute trip. Lion Air, Jakarta-Soekarno-Hatta, Medan, Batam. They have two daily flights from Jakarta and one from Medan. Flies from Batam to Banda Aceh on Sunday, Monday, Wednesday, and Friday. SMAC, Blang Pidie, Meulaboh, Simelue, Takengon, Tapaktuan. Flies daily from Medan to Nias Island and Simeulue Island. There are rental minibus available from Medan to major cities in Aceh. Visa formalities at this airport are similar to those of other Indonesian immigration gateways. Visa On Arrival (VOA) service is available at Sultan Iskandar Muda Airport. A bus provides a service from Banda Aсeh to the airport, and from the airport to Banda Aceh. Operating hours are 10/11AM-2:30PM, price to the city is Rp 15,000/person. The bus departing from the airport to Banda Aсeh leaves a few minutes after airplanes land. So departure time depends on landing time, more or less. Thus, it's advised to hurry to catch the bus. It is on your left when you leave the airport building (taxi drivers will tell you there is no airport bus, just keep on walking because the bus is there). Please note that this bus goes to Banda Aceh City Centre; it does not go to the Bus Station or Ulee-Lhue Harbour. If you want to go to the Bus Station or Ulee-Lhue Harbour, take a becak after being dropped off in the City Centre by the airport bus. The closest big (international) ferry terminal is Belawan Port, close to Medan. It receives vessels originating from Batam, Indonesia (a common route when coming from Singapore). The ferry from Penang is no longer operating. From Ulhee-lhee, the port of Banda Aceh you can go to Pulau Weh and to Pulau Aceh. One knowledgeable friendly becak driver is Little John, who speaks English and Japanese. He also has the only actual wifi becak in town! Find him on Facebook (Little John Banda Aceh) or phone +62813 6023 1339. The stop of the Great Mosque is located at the Eastside of the mosque. The one at the harbor is just at the opposite side street side of the ticket counter. It is possible to go on a "Tsunami Tour" as there are many boats still inland and other monuments devoted to the devastating day in 2004. Apung 1 ship, a 2,600 ton vessel that was swept 2 km inland. Now it is a tourist attraction. There are approximately 65 NGOs currently operating in Banda Aceh; however, they generally do not recruit non-Indonesians locally. These NGOs include various UN and EU agencies, USNS, Care, Americare, Islamic Relief, International Federation Of Red Cross and Red Crescent, Australian Red Cross, Turkish Red Crescent, Kuwaiti Red Crescent, French Red Cross, IMC, IOM, WHO, Japan International Cooperation System, Habitat, Medecins sans frontières, Japan Platform, USAID. At the peak of the post-Tsunami aid effort there were 850 NGOs, but many of these were non-Muslim religious organisations and their permits were not extended by the Indonesian government. There are interesting fish, meat and vegetable markets in the centre of town. There are also some small souvenir shops selling various local items. Check out Kue Kacang Sabang - it is a sweet dessert (kue) made from green beans (Kacang Hijau). The recently opened Hermes Palace mall is located at the city centre of Banda Aceh. The mall has over 100+ stores with foodcourt, supermarket and clothing stores. The Acehenese breakfast staple is nasi gurih, rice cooked in coconut milk, sold in coffee shops everywhere. "Nasi Gurih" is similar to "Nasi Lemak", the breakfast food commonly eaten in Malaysia. Food stalls and Padang restaurants are open across the undamaged part of town, and fruit carts are ubiquitous. Canai Mamak KL Restaurant, Jl Teuku Umar No 51, Seutui, . Malay Food, Halal Toyibah. SHIDQI Cafe, Jl. Malikul Saleh, Lamlagang, (on the left side of the Red Crescent Hospital), . Naturalis Cafe. La Piazza Italian Restaurant, Jl Bhakti no 33A-B, Kampung Laksana, ☎ +62 651 31035. Best restaurant in town, not just for its fresh seafood, pasta and pizza, but also its great roof top garden. Dishes work from an Italian template, but with the best ingredients Banda Aceh has to offer. Drinks menu available. Also open weekdays for lunch. Imperial Kitchen, Jl Teuku Umar. High quality Chinese restaurant. Country Steakhouse, Jl Sri Ratu Safiatuddin 46D. Steaks, hamburgers, salads; western style food. Banda Seafood Restaurant, Jl Panglima Polem 125, (near the Kartika Hotel). Fine chicken, meat and vegetable dishes. Big Top, (across the road from Warung Ibu Pocut). Chinese and Indonesian dishes. Tower Coffee, (previously Putra Jaya), Jl Tgk Haji Abdullah Ujung Rimba No 14, (off Jl Muhammad near Masjid Baiturrahman). Panang style dining in nice A/C atmosphere with some English-speaking waiters. Niagara Cafe, Jl Hasandek 8-9. Has every fruit juice imaginable and a satay stand outside. Hermes Palace, (formerly Swiss-Belhotel), '. The restaurant here presumably offers the best hotel food in town and has nice dinner buffets as well as a la carte. Sultan Hotel, has a popular cafe, while the chef at the hotel’s Koetaradja Restaurant boldly tries his hand at a Sultan Burger. There are some nice coffee houses with soothing rice paddy views around Ulee Kareng, along Jl Tengku Iskander on the town’s western outskirts. Three fast food chain restaurants may be found in the centre, A&W, KFC and Pizza Hut. Drinking alcohol is not allowed. Coffee-drinking is the main activity. Beer is discreetly available in some larger 'western' hotels and a few 'western style' restaurants. Hotel Medan (in the centre). 1 star hotel, Jl. Ahmad Yani No. 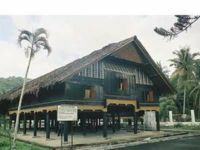 17 Peunayong-Banda Aceh, Phone :+62 651 21501, Web: www.hotel-medan.com price Rp 260.000/night for standard room (double bed or twin bed). Hotel Sultan (in the centre). 2 star hotel, around US$30-40. Pavilliun Seulawah, Jl. Prof. A. Majid. Ibrahim II No. 3, (in the centre,). Good hotel with a restaurant, wifi is included. Next to a park with sports possibilities. Around US$50. Oasis Hotel (just outside the centre). More cozy than the Swiss Bell and the rooms are just as nice, with WiFi in the lobby. Around US$75 per night. Uncle's Homestay, Jl Mujahidin No. 2B, Lambaro Skep. ☎+62 852 6028 4432 (mobile phone) or homestay ☎+62 651 26219. The family who run it tend to be noisy through the night so sleep can be difficult. Both Abdul and his wife Yulia speak English. A homestay room with fan for about Rp 75,000, A/C costs more. As with all travelling, common sense and a good attitude is all you need to get along in this small city. However there are some points to keep in mind. It is best to not go out alone after 10PM. Because Sharia law is enforced, drinking alcohol is not permitted, although it is still possible. Infractions upon the locally perceived interpretations of Sharia law may result in arrest by the Sharia police with physical punishment and public ridicule imposed upon an offending Muslim. Muslim women should normally wear headscarves in public areas. Western-style swimsuits are not advisable except in Sabang. Pick-pocket activity is rare but do be aware and observant in crowded places. Lhoknga and Lampuuk, beautiful beaches 17 km west of the city, great for surfing or just relaxing on the beach. Pulau Weh, Sumatra's divers capital, via a 45 minute fast ferry service. Nice beach at 'Three Wells' with good snorkeling and a small cafe restaurant serving local and westernised food. Bungalows overlooking the sea are available to rent. Medan, many overnight buses of varying quality to Medan, the best is Simpatistar. Leaves at 8:30pm from bus terminal, Rp 270,000 for luxury sleeping chair, arrives around 7am in Medan. Two warnings: Ask to get off at Pinang Baris bus station in Medan or you'll be dropped 5km away at Simpatistar bus office. And beware the scamming young men at Pinang Baris selling onward tickets at 4x real rates. This page was last edited on 5 February 2019, at 00:25.